Like much of the rest of the eastern United States, the winter of 2014 in North Carolina was wickedly wild. One week we will had lovely 70 degrees and the next week (or even the next day) it froze. And unlike the North, we are unprepared. No snow tires, very few plows, no snow shovels. Of course I still have a snow shovel but even when it snows I rarely use it. Everything shuts down so I don’t need to get out of the driveway – why bother. It will melt the next day anyway. So during one of these “shut down” snow days when I couldn’t get out or run my errands I played with fabric. I had some lovely screen printed cloth and a great inspiration. Libby Lehman is one of the greats! 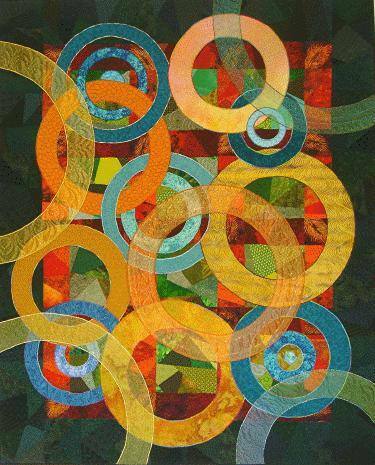 She has been a talented quilt artist and one of the best teachers there is for longer than I’ve been quilting. Last year she had a devestating stroke at much too young an age. 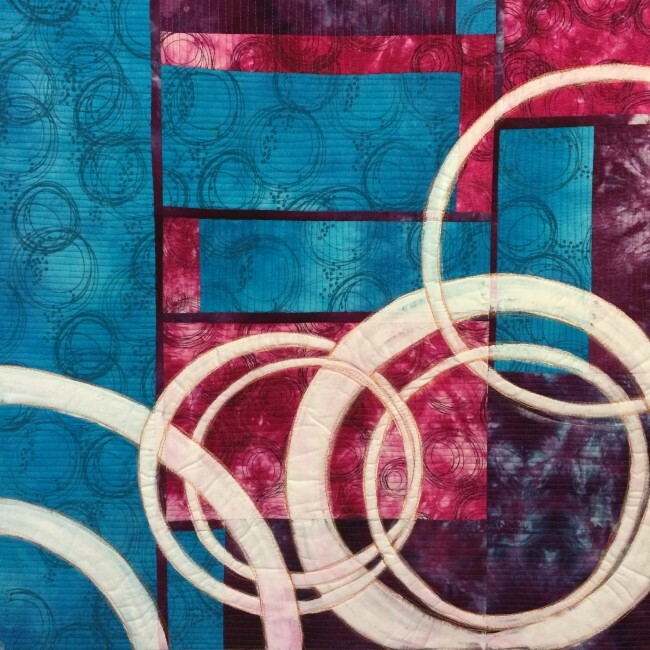 A number of artists have been invited to use one of her quilts as inspiration to create a work of their own. These quilts, inspired by Libby, will be exhibited then auctioned, raising funds to help defray some of her medical expenses. Once my quilt top was printed and pieced I played a little further with paint then slapped the piece up on my design wall while I played with the kids for a while. 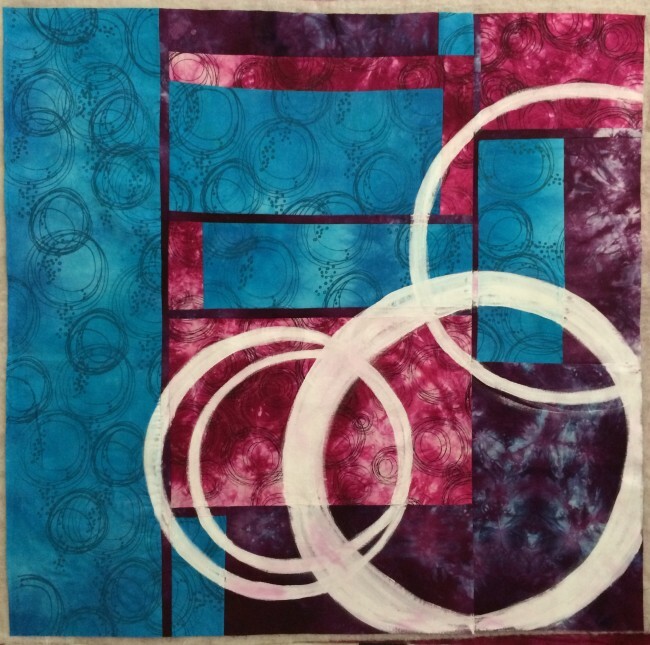 When I came back to take a look at the work the circles just weren’t enough so I added a few more, quilted some straight lines to contrast with the circular elements and once again, set the piece aside for a while. The next morning I decided that the piece needed some warmth to contrast with all those cool colors. I didn’t even think about how vibrant a predominantly primary color scheme would look until it was done. 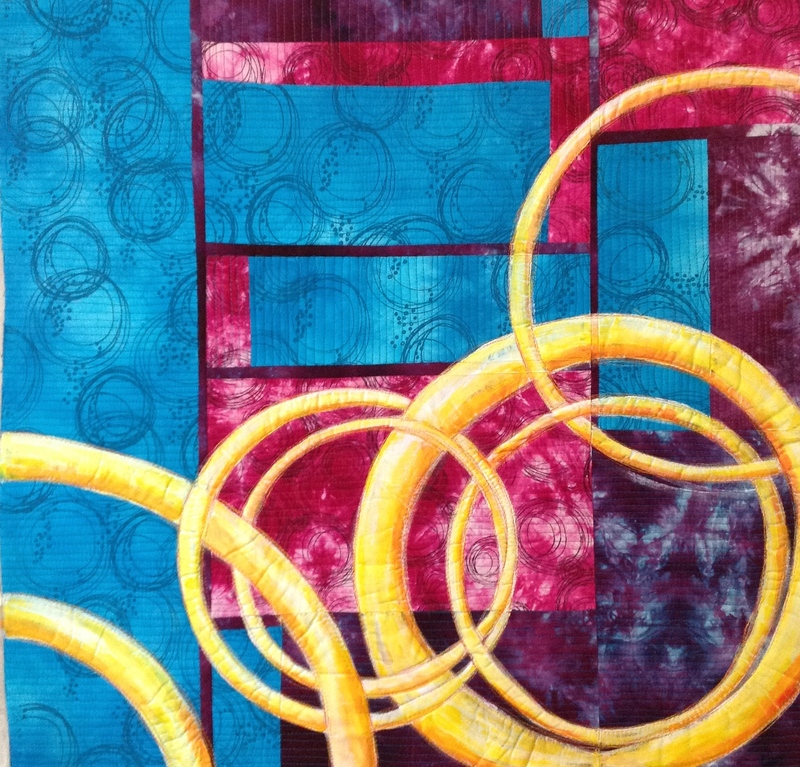 A few darker orange swipes to add some depth of value and I think we are done. I’ll let you know when the pieces go on display and when they will be auctioned. At the end of February Ricky Timms and his partner, Justin were able to visit Libby in her home. She was able to answer the door herself with the aid of a walker. Good for you Libby!!!!! LOVE this piece you made inspired by Libby’s piece. You are both VERY talented!